I don’t know if it is that the older I get each year becomes a smaller slice of the overall pie of life, but it sure is true that I experience years more and more as the blink of an eye. We have experienced another blessed year together. We have experienced the power of this year’s theme as it took on increasing significance and meaning for us as we journey though the year. God has cultivated his shalom in us, and we have been blessed to cultivate shalom in others in a variety of ways. We have celebrated highs together, and, as always, we have also shared burdens and supported each other as a school family this year. Through it all God has been so faithful and good. 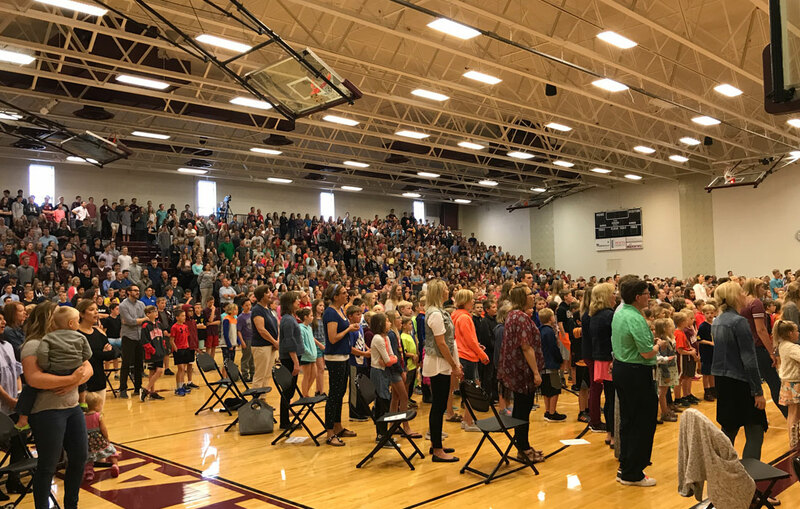 So, at the end of this school year we give him praise and thanks for his goodness, faithfulness, and presence that we have experienced as a school family. Indeed, he is a Good, Good Father, and a Faithful Shepherd. I remain so blessed to be your Principal at Rose Park again this year, and am grateful for each of you as members of this school community. I am so expectant and confident of God’s continued blessing for next year already. Please join me in that expectation and prayer. But, before that, I want to wish you and your families a blessed, safe, and joy-filled summer vacation! May you experience many wonderful adventures, as well as those simple, lazy days of summer. We’ll see you again very soon, friends! Now, at the end of this 2017-2018 school year, may you bless and be blessed this summer with your families in rest, recreation, and in hopeful, thankful, awe-filled worship. It remains our deepest privilege and blessing to partner with you, equipping young and eager minds, nurturing soft and tender hearts, to transform the world for our Lord and Savior, Jesus Christ. We can’t wait to see what God has in store for all of us together next year! Have a blessed summer! It is never too early to start shopping for school supply sales! Please click here to see what your child will need for the 2018-19 school year. Each year we “graduate” a group of 6th graders on to middle school which is a significant transition…one of many in life. So, too, we experience transitions with staff for a variety of reasons. Due to some restructuring flexing on enrollment, we do bless and say farewell to 2 of our teachers for next year. Mrs. Karina Schebor has taught 1st grade at Rose Park for 6 years, and has blessed students and families alike with her teaching, encouragement, love, and care for all students in her classroom. Next year she will be teaching 1st grade at our sister campus, South Side. We also bless and say farewell to 4th grade teacher, Mrs. Ellen Jacobs. Mrs. Jacobs has taught a variety of grade levels at HC over the last 20 plus years, most recently being 4th grade at Rose Park. Mrs. Jacobs has blessed her students and families with her teaching, but also with the love and support she offers and cultivates in her students for each other, and for others. Already, Mrs. Jacobs is responding to God’s fresh call to volunteer at Helen DeVos Children’s Hospital in a patient relations role. Our prayer and full confidence is that God will continue to bless and use Mrs. Jacobs and Mrs. Schebor to cultivate shalom wherever he calls them. Please join us in blessing and thanking these beloved teachers. Parents: As you are getting ready to transition your child from Rose Park/Pine Ridge, please remember to check with your doctor’s office or the Ottawa Co Health Department regarding immunizations. All immunizations must be up to date before students start school. According to Michigan law, which Holland Christian Schools follow, only students with a complete immunization record or Ottawa Co approved waiver will be able to enter the school when we start on August 21, 2018. Please see this flyer for all immunizations required by the state for all 7th graders. These will need to be taken care of BEFORE your student(s) may start school in the fall. Thanks for your help with this. Rose Park/West Ottawa Transportation Information for the 2018-19 school year. All 2018-2019 busing information and instructions on how to access and register for busing next year, including the shuttle to and from the MS and HS, is now available at Rose Park/West Ottawa Bus Transportation Form. There you will find a link to the online registration form you will need to register your student(s) for busing. You will also find contact information if you have any further questions. Deadline for registration is June 4. West Ottawa busing will begin on August 28, 2018. There will be tables displaying all the items that have been collected over the last few weeks. Please take a moment to see if your child’s shirt, sweatshirt, jacket or other item is on the table. Any items left will be donated to Ditto on June 4. We are working on our staff needs and want to make sure we have things in place by the beginning of the new school year for our After School Care program. Schedules do change over the summer but as we get ready we would like to get a picture of what our needs will be. Calling all 2018-2019 3rd and 4th grade girls interested in cheering at the 3rd and 4th grade boys home football games next fall. At this time, we are just trying to gage interest in setting up such an activity. There likely will be 3 or 4 home games played Saturdays in September. Practices would likely begin mid-August on Tuesday and Thursday evenings from 5:30-6:45 at Rose Park, and led by Rose Park parent, Sarah Dangler. If you have questions, would like more information, or would like to register your interest, please contact Sarah at 616-403-8761, or csdangler@yahoo.com. Our Rose Park office fish tank is a HUGE hit with our kids and visitors! We are thankful for a great source of entertainment and conversation! However, it is VERY dirty. It is in desperate need of some TLC. We are looking for a helper to tend to our tank. Do you have knowledge of how to clean fish tanks? If so, we would greatly appreciate it. Please contact Carla or Diane in the office if you are interested. Thank you! Don’t stop reading this summer! Summer is a great time to pick up a good book and read. We have lots of resources to help your student’s reading this summer! We have free access to over 5000 books, both fiction and non-fiction, at various reading levels. Find these ebooks, which can also be read as e-audio books, at www.mycapstonelibrary.com, or with the Capstone Interactive mobile app.username: summer18, and password: lovetoread. See the family information letter for learn more about this resource. Click http://www. storylineonline.net/ for short videos of picture books, read aloud by actors and actresses. If you are interested in tutoring opportunities for the summer, we have a list of wonderful tutors available in the office. MOMS IN PRAYER- Moms, would you consider giving your student(s) 50 minutes of standing in the gap for them in the form of prayer? The RP MIP group will reconvene in September on Friday mornings. Please click here for a full list of summer camps available. Please click here to see the City of Holland’s family events this summer. Questions? Contact Anne Reilly-Clegg at areillyclegg@ GoodSamMinistries.com or 616-392-7159 ext. 111. Looking for a way to earn service hours while supporting a good cause? Join in the fun and volunteer for Good Samaritan Ministries’ 4th Annual Good Sam’s Wild Run! Kids ages 4-13 will maneuver obstacles designed by local companies. All proceeds go to support youth programming at Good Samaritan Ministries that work to end the cycle of generational poverty.